Because people are the core of your business and ours, Outreach gives you the power to reach more leads with tailored, personal interactions. For instance, you can use templates to quickly insert common text for emails through a simple picker. Or use Snippets to drop smaller bits of text, links or paragraphs anywhere in your email to answer FAQs with one click. Engage your prospect far more efficiently, with an authenticity that’s never been possible at this scale before. Schedule the delivery time and date of your message. If you don’t receive a reply, automatically follow up with your leads. Automatically post activities to Salesforce in the background, without manual actions. Schedule a reminder for yourself to take action on a lead. See when leads click your links and open your messages, by device and location. Set Email Bump to remind you to engage with a prospect later, right from your inbox. 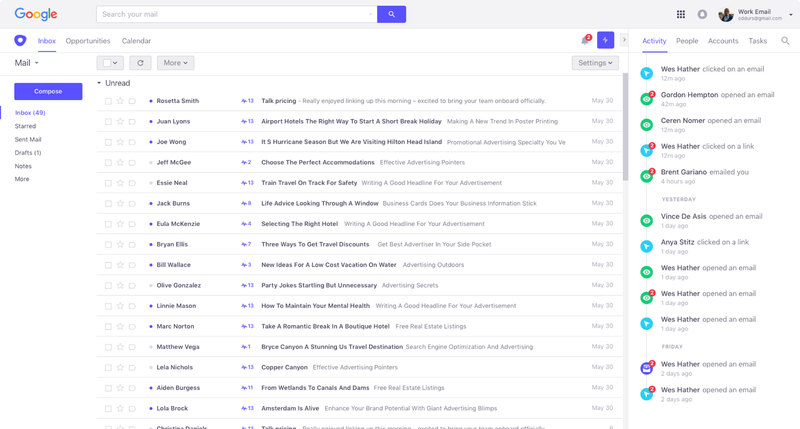 Ready to track sales emails sent from Gmail?